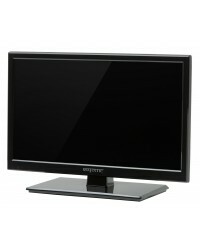 Majestic's latest 19" HD 12 Volt LED TV with built in Global HD Tuner that works in over 150 countries. The New Majestic LED194GS is the latest addition to the range with state of the art engineering from Majestic. The LED194GS is packed with new technology such as DVD, Majestic Link, ARC, USB for Multi Media and MMMI for iOS and Android capable devices to give you full HD video interface. 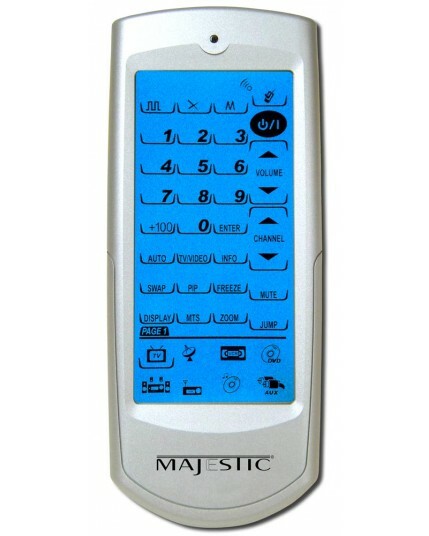 Majestic Electronics was the world's first company to develop and produce a 12 Volt LCD TV back in 2000. Fast forward the company's growth and technology advances, Majestic remains a global leader in engineering and designing specific TV's that can handle the harsh Marine environment and survive the tough outback conditions. The Majestic products are built with the highest possible standard and used by some of the world's best known Boat Manufacturers such as Regal Boats, Rinker Boats, Four Winns, Ranger Tugs, Monterey Boats, Hydrasport, Power Cat, and many more. 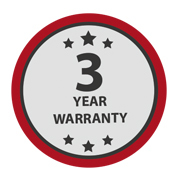 You can be assured the quality and reliability as Majestic covers every product with a 3 Year International Warranty. 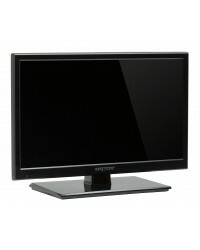 Our latest 19" HD 12 Volt LED TV with built in Global HD Tuner that works in over 150 countries. The New Majestic LED194GS is the latest addition to the range with state of the art engineering from Majestic. The LED194GS is packed with new technology such as built in DVD Player, PVR on DVB-T Signals, Majestic Link, ARC, USB for Multi Media and MMMI for iOS and Android capable devices to give you full HD video interface. Global Solutions TV Tuner: Majestic is the world’s first company to engineer a 12 Volt LED TV with Tri HD Tuners. 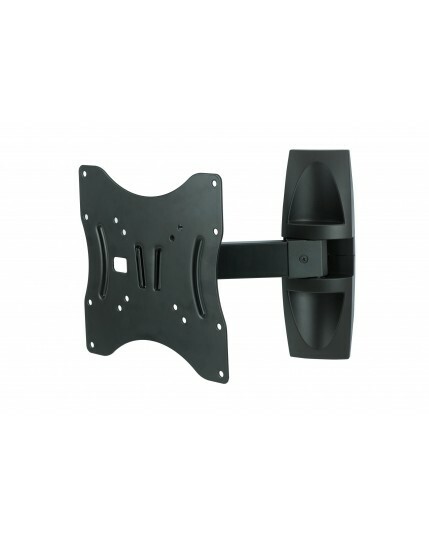 The three TV tuners are designed to give the Marine customer capabilities to travel to over 150 different countries and be able to tune in the local TV Stations. The Majestic LED194GS has a Built in DVB-T2 H264 MPEG4 HD Tuner, with DVB-S2 HD Satellite TV Tuner for Europe and Pacific Region and finally an ATSC HD Digital Tuner for North America. Power Consumption: Working with RV and Boat manufacturers world wide, Majestic knows that a critical factor is power consumption. Most brands do not care about this as they believe consumers do not care. However Majestic knows that every extra Watt the TV uses is some form of energy cost to the end user, but more importantly in many situations domestic branded TVs draw so much power that over night they can flatten your battery system. Majestic's engineering team has made sure that the design of the TV only uses the power it needs to and therefore is ultra efficient. 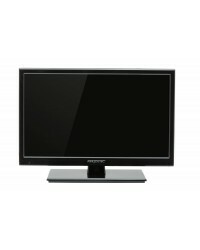 The Majestic LED194GS LED TV draws 1.9Amp @ 12V while watching TV. Now comparing this to a 100W Light bulb you can operate 5 Majestic 19" LED TV's and use the same amount of energy, this ensures that you can watch TV of a night time and not worry if it will draw too much power from your batteries, this is how efficient the Majestic LED TV's really are. 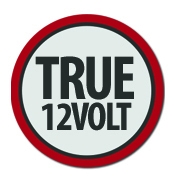 Voltage Range – Most TV brands claim they are 12 Volt, and technically yes they work on 12 Volts. However the issue is the level of tolerance the TV has, most 12 Volt TV’s have a limited tolerance, generally between 11V and 14V. This can cause many people problems especially when they have long cable runs, or the battery voltage drops a little (especially late at night), or even if they have a poor power connection. 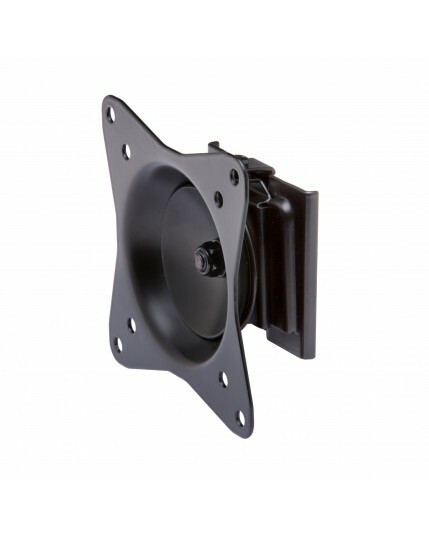 The Majestic TV’s are designed to work from 9V through to 27V DC, therefore ensuring you will not have any power issues. 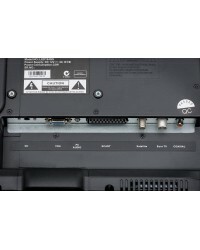 The TV is not designed to work on a 24V system as most 24V systems charge at 32V. One Touch Tuning: How many times have you seen people move their boat or RV to a new location and they cannot get TV reception? Then they have to pull out the instruction manual and try to work out how to re-tune the TV as domestic branded TV's are not designed to have to re-tune done regularly, your house does not move so once you have tuned your TV then you never touch it again. Majestic knows that in mobile situations like Boats and RV's that you are constantly moving in different areas. So Majestic added a simple feature to the remote control - SCAN. When you have relocated to your new position, simply push the SCAN button and the TV will go through and Re-Tune to the new location and get all the channels in your new area. - Let's make it simple. Multi Media Display - Most Boats and RV's are designed to be your home away from home, but when the weather conditions are bad and you have to be inside you want to be able to enjoy some of the creature comforts you have at home. 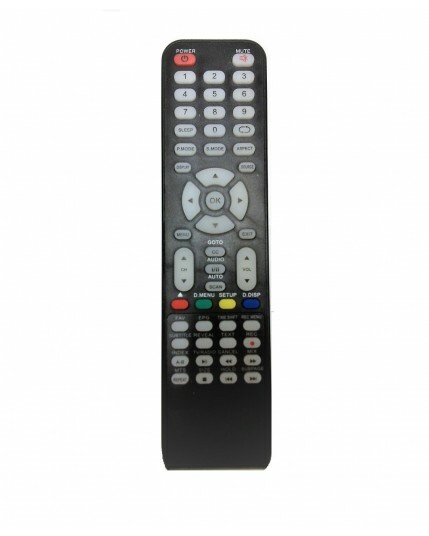 The Majestic TV is designed with a multitude of inputs such as: VGA, Component, Composite, HDMI, and USB. Basically you can connect up almost any device to our TV and it becomes a large screen display. You can connect your USB hard drive with movies, music or photos and then have hours of entertainment. Majestic Link: With TV’s being the primary focal point of most of our entertainment, the Majestic Engineering team had to work out innovative ways to interface the Majestic TV to other products. 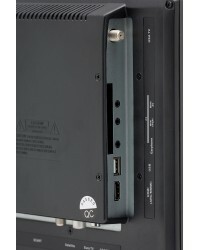 Majestic Link is software that allows function control to other compatible devices that connected via the HDMI cable. The Majestic link is compatible with, Samsung’s Anynet, Sony’s Bravia Sync, Pioneer’s Kuro Link, Mitsubishi’s Netcommand, Toshiba’s REGZA-LINK, LG’s SimpLink and Onky’s RIHD. ARC: Audio Return Channel is a new feature that has been added to the Majestic TV which allows you to send the audio through the HDMI cable to another ARC compatible device. This is an excellent feature when integrated to audio devices such as Fusion Stereos, Bose Audio systems and many others. This allows Dolby Digital Audio to be sent via the HDMI Cable to give you a sharp crisp sound, instead of using a two wire system with a dedicated Audio Cable. USB Functions – The Majestic LED194GS has a USB that is designed to take most of your Multi Media files and display these on the screen. So if you have a hard drive or USB stick with photos, you can select the folder and with you photos and then the TV will go through them like a slide show. If you have movies or music simply select what you want to watch or listen to and the TV will display these. 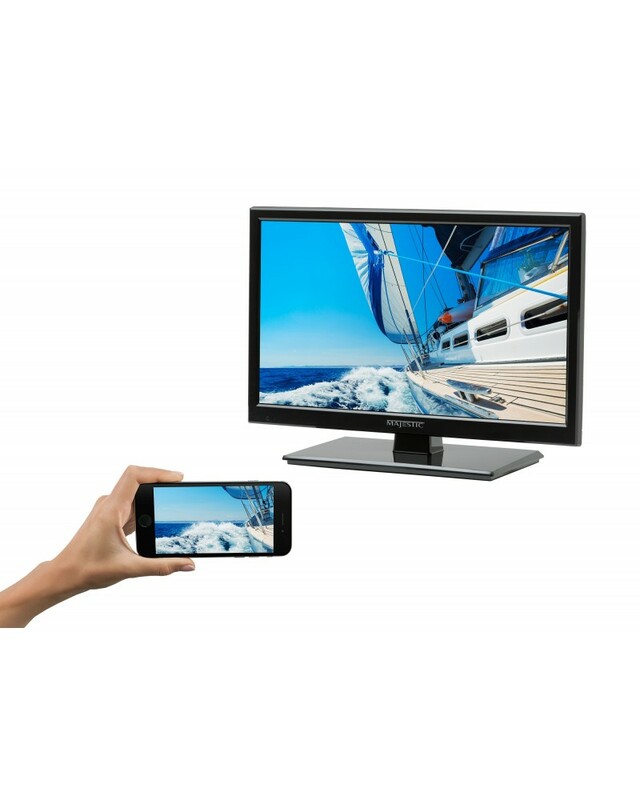 MMMI - Majestic Multi Media Interface - Majestic has engineered state of the art software and hardware that allows connectivity of your iOS or Android Phone or Tablet to be displayed on the Majestic TV. 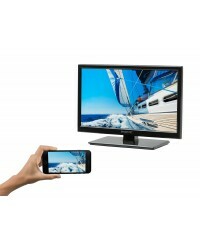 So whatever you do on your Phone or Tablet will be displayed in HD on the Majestic TV screen. This means if you have an internet connection through wifi or cellular and want to surf the internet, do your emails, use facebook, watch You Tube, watch movies from Netflix, iTunes or Google Play all of this is done on your phone and the video and audio comes through the large screen Majestic TV. You can also use this feature without internet if you want to use your apps or simply watch movies or listen to music that has already been downloaded to your Phone or Tablet. 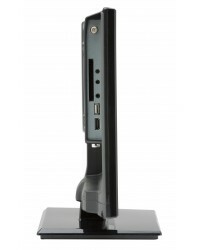 Connectivity is simply done with a HDMI Cable going in the HDMI MMMI port of the TV and you will need an adaptor to match your Phone or Tablet to the HDMI cable, select the HDMI port on your TV and the rest is plug and play and now you can watch the TV come to life through your mobile device. 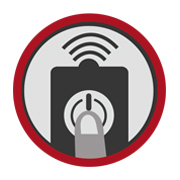 Most Boats, Caravan and RV's are designed to be your home away from home, but you want to be able to enjoy some of the creature comforts you have at home and the MMMI feature is perfect for that simply bring your Phone or Tablet with you. TV Reception - One important factor in being able to receive TV signal is the TV Tuner. 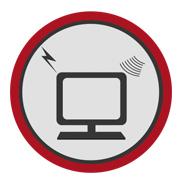 Most companies do not invest the time or money to enhance the TV tuner because in most cases the TV tuner is connected to a cable system with a strong signal level. However in boats and RV's Digital TV reception is all they have access to (unless they have satellite installed). The team of engineers at Majestic has been working to ensure that the TV tuner is of the highest possible gain using the latest in SMT technology. 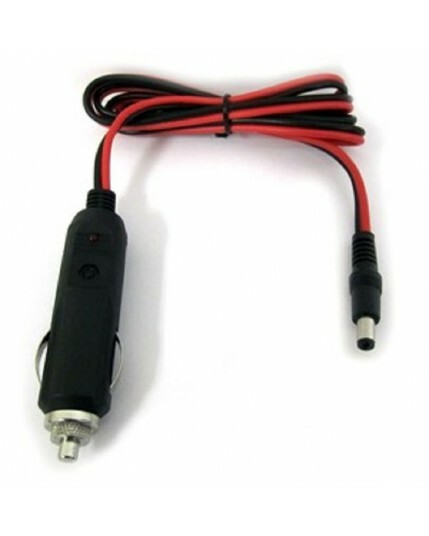 This ensures that the weakest signal is still amplified to give you the best possible signal reception in those distance and difficult areas. 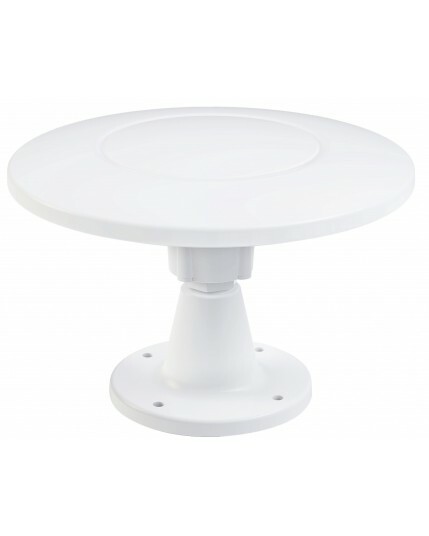 Now when matched with the Majestic UFO X TV antenna which has the highest gain at 30dB for its tiny 9" size, you can be assured that if there is any chance of signal reception, you will be the one that can get it. 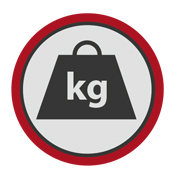 Weight: The physical design of the LED194GS is to be able to withstand the harsh Outback and tough Marine environment. 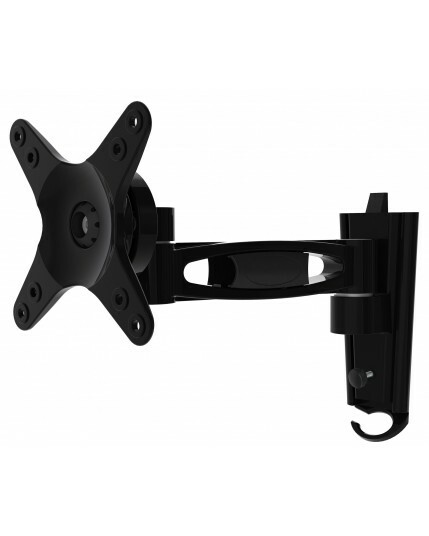 Weighing only 2.4Kg allows this TV to be mounted in almost any location without stressing the surface and with a 100x100mm Vesa hole spacing this TV can be mounted in various different locations using any mounting bracket that has 100x100 Vesa mounting. The TV can be installed almost anywhere and with the wide viewing angles you will always see the perfect picture. 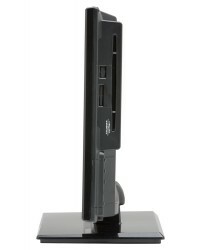 True 12 Volt: Majestic was the worlds first company to make 12 Volt LCD TV's way back in 2000. Majestic was the innovators in engineering the ultimate internal power supply system to be able to handle a variety of electrical power supply issues. This includes electrical noise interference, to prevent static and other electrical noise from causing issues with your TV. Voltage fluctuations is another major impact on electronics and the Majestic TV's were developed to be able to handle these sometimes sudden transients. The Majestic TV's do not need any external power regulators or other type of filters, they use state-of-the-art electronic components and in turn this gives the TV the reliability it needs for a longer life in the harsh 12 Volt Mobile Industry. Software for LED194GS with Colour Menu Screen Satellite Channels with LNB 11.300 Note: Click Right Arrow to import and show "success"
Software for LED194GS with Colour Menu Screen Satellite Channels with LNB 10.750 Note: Click Right Arrow to import and show "success"
Majestic has a worked in conjunction with most of the major mobile device suppliers (phones and tablets) to develop a HDMI port which allows for those mobile devices to output video and audio signal from the mobile device into the Majestic TV. Firstly, go to the Majestic TV Model you are looking at purchasing and then click on the downloads to see the list of known compatible Android devices. If your device is not listed here there is a high chance they do not have the video output capabilities. 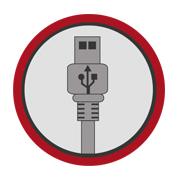 Most Apple Phones and Tablets from 2014 have the video output capabilities provided they use the lightning connector. 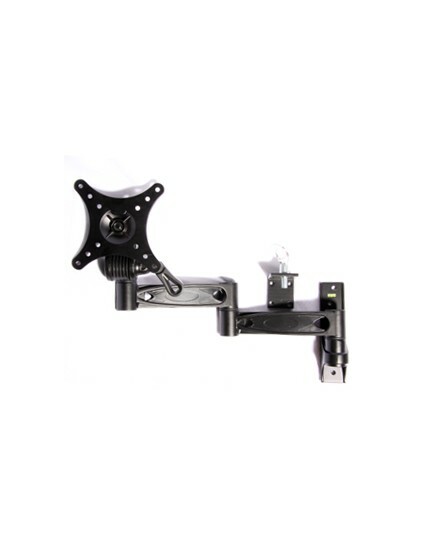 The process is quite simple you need some hardware parts, HDMI Cable from the TV to where the Mobile device will be used, and an adaptor which goes between the HDMI Cable and your mobile device. The Android Device will need the software turned on, so simply search any of the following settings – Dual Video output, Video repeater screen, Dual Display, MHL, Multi Screen or Mirror Cast. 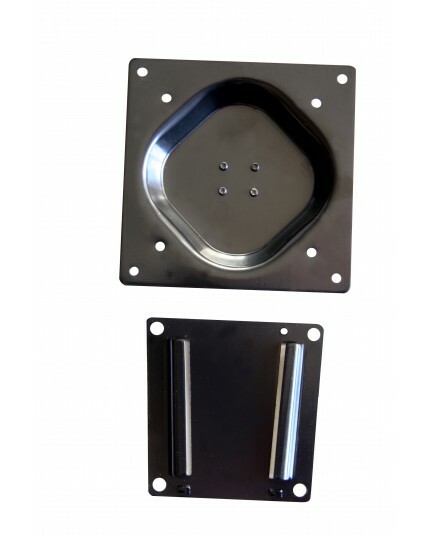 If you cannot find any of these then there is a change that model does not have the feature. Once you have turned on the feature, simply plug the HDMI cable into the Majestic TV into the MMMI port and the other end of the HDMI Cable connect your adaptor the HDMI and to your phone. Once you have done this the system will do everything automatically. For Apple devices it is a plug and play no setting up is required.